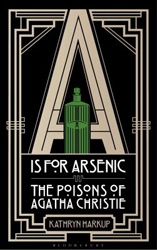 A Is For Arsenic : The Poisons Of Agatha Christie - ubiq bookshop: the best place to buy books! Agatha Christie's detailed plotting is what makes her books so compelling. Christie used poison to kill her characters more often than any other murder method, with the poison itself being a central part of the novel, and her choice of deadly substances was far from random; the chemical and physiological characteristics of each poison provide vital clues to discovery of the murderer. Christie demonstrated her extensive chemical knowledge (much of it gleaned from her working in a chemists during both world wars) in many of her novels, but this is rarely appreciated by the reader. 'A is for Arsenic' celebrates the use of science in Christie's work. Written by Christie fan and research chemist Kathryn Harkup, each chapter takes a different novel and investigates the poison (or poisons) the murderer used.